The B for Bag luggage repair guide covers the most common luggage repairs you should be able to do yourself. All travelers should know the basics in DIY luggage repair (do it yourself luggage repair). Most common luggage problems are easy to fix yourself. You may though need some luggage repair kit and spare parts to fix the luggage yourself. Most loose or broken luggage wheels are easy to fasten or replace yourself. The most common problem with luggage wheels is they coming loose or falling off. This is simple to fix yourself. Just screw the wheel back on or fasten the screws with screwdriver. Just don't tighten the screws too fast as it could cause the wheel to crack. The screw must though be attached firmly enough to make the bag sturdy when wheeled around fully packed. Sometimes wheels get stuck or broken and you will then have to replace them. The first step is to buy replacement wheel and then replace the damaged wheel with the new one. Luggage wheels are normally attached to the luggage base with either screws or rivets. 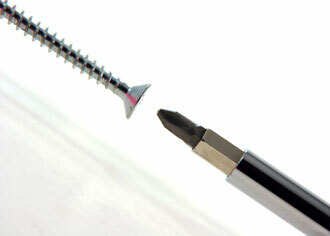 Screws should be easy to remove with screwdriver but rivets can be more of a challenge. If you can get to the bottom of the rivet, then you might be able to pull it out, e.g. by using power drill. If you cannot get to the bottom of the rivet, then you have a problem. You may be able to have the wheel professionally replaced or you might have to replace the bag. Always test your luggage after fastening or replacing luggage wheel. Make sure the wheels are even and the bag sturdy when you are pulling it. Empty bags are always wobbly so make sure you test the bag with some heavy items inside. The most common problems with luggage zippers are they coming stuck, tangled or simple damaged and need to be replaced. The best way to dislodge stuck metal zipper (chain zipper) is to apply wax along the teeth of the zipper. You can get special luggage zipper lubricants but candle wax can also do the trick. It is good practice to wax metal zippers on regular basis to prevent them from coming stuck (and vulnerable for damage). Coil zippers are increasingly used for luggage and they are self-healing, i.e. if the zipper is distorted it can easily be restored to its original condition by simply pulling the slider backward. Replacing broken zipper is usually not a DIY luggage repair job. If the zipper is damaged beyond repair and needs to be replaced, it makes sense to have it professionally replaced. You cannot travel with a bag that has broken zipper. If the zipper breaks while you are travelling, you often have little choice other than to replace the whole bag. It therefore doesn't make sense to travel with a bag with dodgy zipper in the first place. If you know the zipper is dodgy or the bag is not closing properly, then it is time either to change the zipper (before it breaks) or buy a new bag. Luggage carry handles tend to tear or fall off while the most common problems with telescoping handles is when they jam or come cumbersome to operate. Telescoping luggage handles can also break down and then need to be replaced. It can be easy to replace luggage handles yourself but some handles are though more challenging to replace then others. If the telescoping handles system is difficult to operate, there may be some debris that needs to be removed but in most cases cleaning and lubricating the mechanism is all it takes. Start by unscrewing the handle and pull the handle mechanism out. Look into the handle housing for any debris that could be clogging the retracting mechanism (and remove it if you see any). Before you put than handle back on generously lubricate the whole mechanism. Then screw the handle system back on and extend and retract the handle few times to evenly lubricate the whole handle system. The first step is to buy replacement handle, then remove the old one and put the new one in. Sounds simple enough. Most luggage handles have screws or bolts on the inside and outside of the bag. Start with the screws inside the bag. Most luggage allows you easy access to those screws, e.g. by unzipping the inside liner. But sometimes it can be difficult to get to the screws without damaging the internal liner. If this is the case, then you might want to take your bag to luggage repair shop. When you have replaced the handle, apply lubricant (e.g. WD-40) to it. Make sure you distribute the lubricant evenly by extending and retracting the handle few times. And don't forget to test your luggage after replacing the luggage handle. It is usually straightforward to replace the carry handles, i.e. if you can find suitable replacement handle. Most carry handles are screwed with two screws at the top and two at the bottom, i.e. inside the bag. The most likely problem you might encounter is regarding access to the inside screws, like with the telescoping handle. If carry handle falls off while you are travelling and you cannot replace it in time for your return trip, there are some temporally fixing you may be able to do with super glue and duct tape. Just apply few drops of super glue to the handle and press it firmly on the luggage base for minute or so. Wrap the handle with duct tape to add strength to the handle. Wrap from one end of the handle to the other, for maximum strength make sure the duct tape overlaps when wrapping the handle. Stains and tear in the fabric is the most common fabric DIY luggage repair. We look at how to remove stains in Luggage Maintenance. If the tear is small, you may be able to sew it together. You may though prefer to glue it together, especially for larger tears. You should use fabric glue for all bags made of fabric, vinyl cement for luggage made of vinyl and rubber cement or vinyl acetate adhesives to repair torn leather luggage. Just apply glue to the inside edge of the torn fabric and press the torn edges together to close the tear. If there is still a gap, then apply glue along the seam on the outside as well. Wipe off any excess glue and allow the glue to dry properly before using the bag. If the tear is substantial, then you might have to use patch from matching material underneath the tear. The biggest problem with hard case luggage tends to be dents and scratches on the hard surface. To fix dents in metal luggage (e.g. aluminum) tap the inside of the case with hard block of wood until it pops back into shape. Be careful though, if you do it too intensely you can damage your bag for good. To fix dents in luggage made from plastic materials (e.g. polycarbonate, polypropylene, ABS) hold hair dryer to the dented side. Heat the dented area for approximately ten minutes. The heat should resolve the dent but if needed you can apply light pressure from behind the back to help the dent to pop back out. It is usually very inconvenient when the luggage breaks down while you are travelling. In most cases, you will not have the time or the tools to fix the luggage yourself, meaning you are likely to have to buy a replacement bag on the spot. It is therefore good practice to clean and maintain your bag as soon as you return home from your travels. This means your luggage will be in good condition when you next need it. If you notice anything "risky" about your bag, e.g. difficult to close the zipper or sticky telescoping handle mechanism, repair it before it breaks down. And remember, at some point your luggage may be beyond repair. Accept it and buy a replacement bag rather than risking our bag breaking down on you when you least need it. Below is a selection of luggage repair kits which you can buy from Amazon. Make sure you buy one today, it is better to have one available when you need it!